Peyton Strickland has been named as one of Aviation Week’s 20 Twenties for 2019. 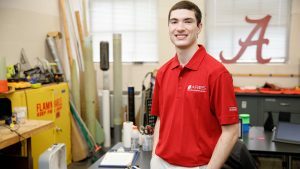 Peyton Strickland has been named one of Aviation Week’s 20 Twenties for 2019, sponsored by the American Institute of Aeronautics and Astronautics. The Pelham, Alabama, native is the first UA student to receive this award. 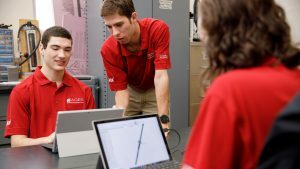 An awards ceremony will be held to honor the 20 students on March 14 in Washington, D.C.
Strickland is in his third year at UA and is working on completing his bachelor’s degree in aerospace engineering by May 2020 and his master’s degree, through the accelerated master’s program, by December 2020. Finalists for this award are decided based on the nominees’ academic achievements, current work toward their career goals and community service efforts. Strickland has previously worked with the MITRE Corporation in support of the U.S. Department of Defense Missile Defense Agency and is considering working in an area related to rocket propulsion in the future. Olcmen, Strickland’s graduate adviser, nominated him for the award based on his academic achievements and philanthropic efforts in encouraging students in low-income areas to pursue a career in research. Strickland has chosen to continue his master’s education at UA because of the quality of the faculty throughout his undergraduate experience.